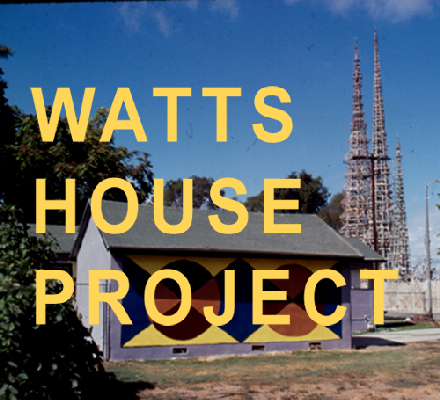 So, it turns out that "Watts" represents more than just Mary Stuart Masterson's role in Some Kind of Wonderful. Go figure. No, but seriously, not only have the 17 Watts Towers–originally built in spare time by an Italian construction worker–been in a restoration-phase (now apparently without scaffolding for the first time in ages), but artists have begun a crusade to upgrade the homes directly across the street (referred to as an "artwork-as-neighborhood-redevelopment" project). The campaign has been led by artist Edgar Arceneaux, but I think LACMA is sponsoring the latest endeavor. 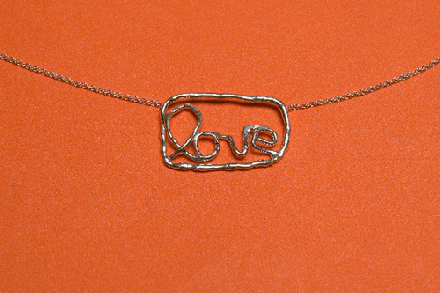 Now, according to LA><ART, artist Alexandra Grant has designed the above "Love Necklace" in order to raise money for the project. She hopes to prop a "Love Sculpture" atop a home's roof on 107th Street and you can buy the $150 piece via the LA><ART website. I admit the concept feels a bit on-the-nose, but–perhaps thanks to contrast and juxtaposition–it could be cool looking. Just in time for VD Day . . . Oh, wait. That's redundant. Unless we're celebrating VDs. Anyway, I plan to go check this whole scene out myself shortly. Just as soon as I can reach Eric Stoltz. No, really, I'm going. With Eric Stoltz. No. But I am going to go. Really. Eric? No. But I am. P.S. I have to admit that I saw He's Just Not That Into You yesterday and their reference to Some Kind of Wonderful may be the ONLY reason why I remembered that the character's name was Watts. Props.